When you were introduced to the brand new Death Cab ap, you thought it was simply a discount cab service with an emo twist. You shrugged and downloaded it, cause who doesn't want options when the nearest car is twenty minutes away and the fees have tripled because it's snowing outside. It was weeks later when you decided to give it a try after a late night out. You did think it was strange that it was a skull creeping along the map towards you. But the driver had great ratings so what were you going to do? Then, when your ride was there, you glanced out the window and to your surprise there was no vehicle what-so-ever outside. No Honda, no hearse, nada. Until you noticed a shadowy figure beckoning at you through the window and tapping at his watch. You didn't want to get charged without getting a ride. Turns out, it was a great decision! The cloaked figure took you into his arms and carried you home while you slept like a little baby. Turns out the grim reaper makes a great cabbie. Of course, you gave him a five-star review. You want to stay on this guy's good side! 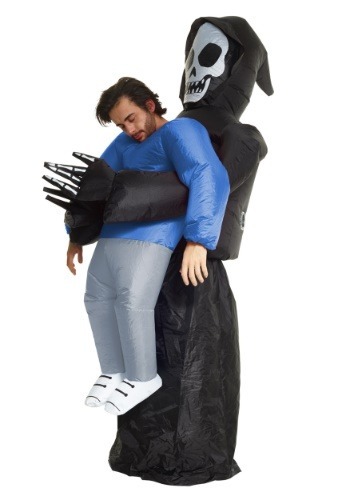 Floating around in the arms of death is more pleasant than ever with this inflatable Pick-me-up death costume. Its has a long black cloak that will cover your legs to make it look like the reaper is giving you a lift. The bony hands wrapped around the inflatable body that's hilariously short with tennies, gray pants, and a blue sweatshirt. your real head will pop up from the blue sweatshirt so you can set the tone, panicked or at-ease. Death's head is inflated above your head with a bare skull that's ready to take you wherever you're headed. We don't want to give you the wrong idea. This costume won't change your life. Once people see you wearing this, they'll have high expectations for your Halloween costumes for years to come. Let's hope you can live up to them!